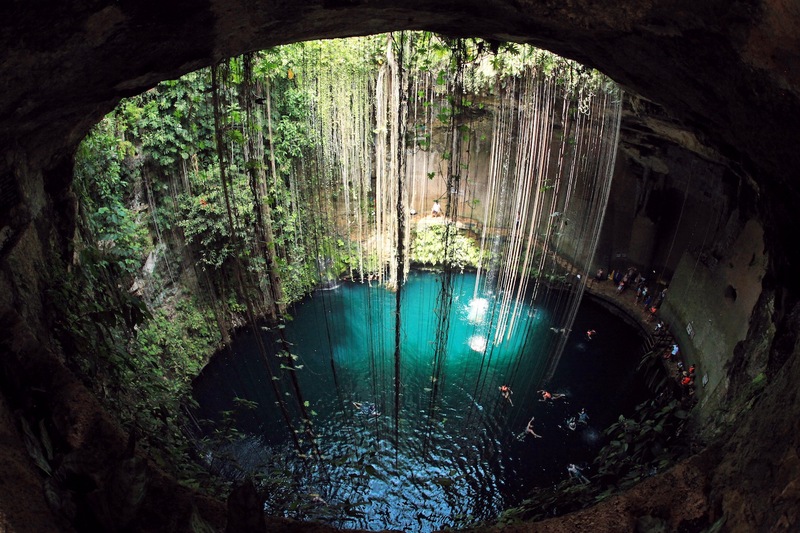 Cenotes in the Riviera Maya. 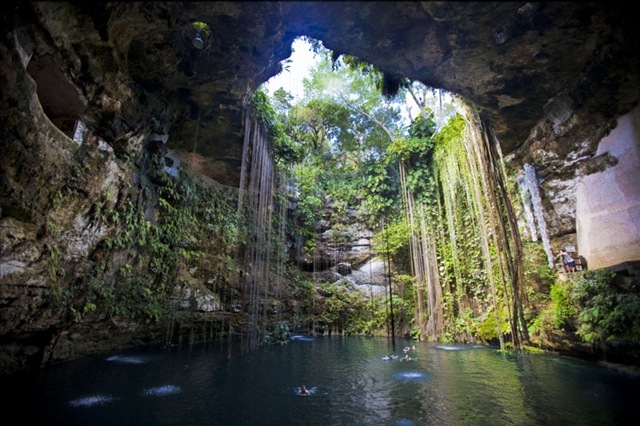 A Cenote is a natural Pit or Sinkhole resulting from the collapse of limestone bedrock that exposes ground water underneath. 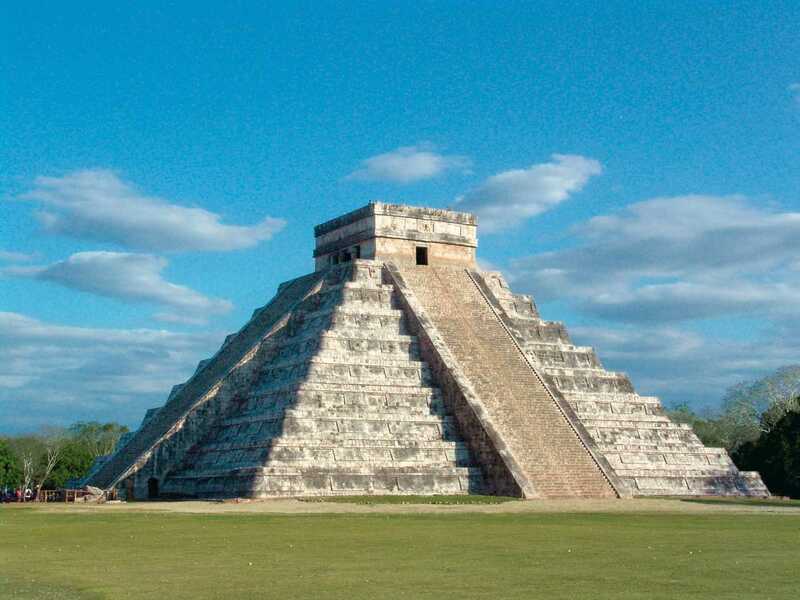 They are located and associated with the Yucatan Peninsula of Mexico. 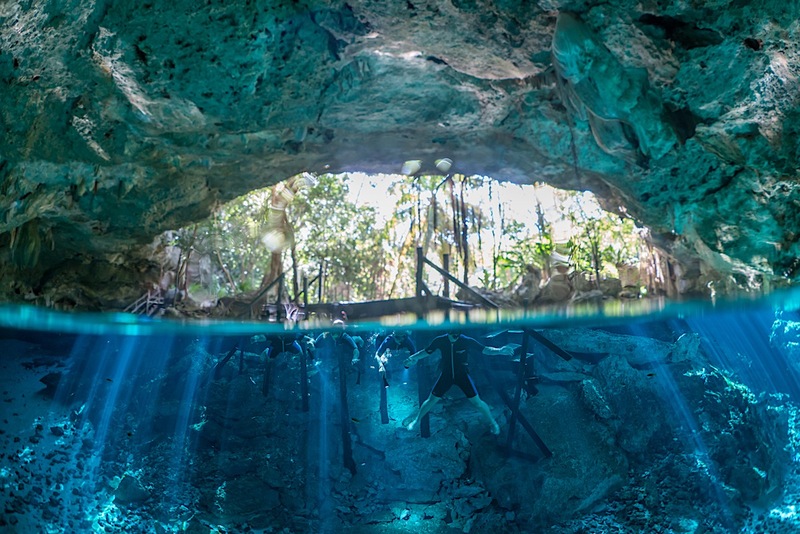 Jug or pit Cenotes: Are those with a surface connection narrower than the diameter of the water body. 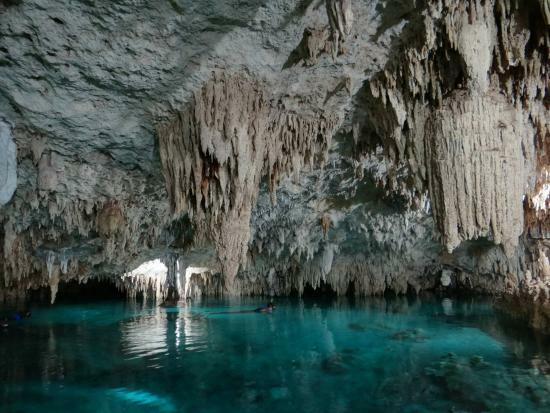 Cylinder Cenotes: Are those with strictly vertical walls. 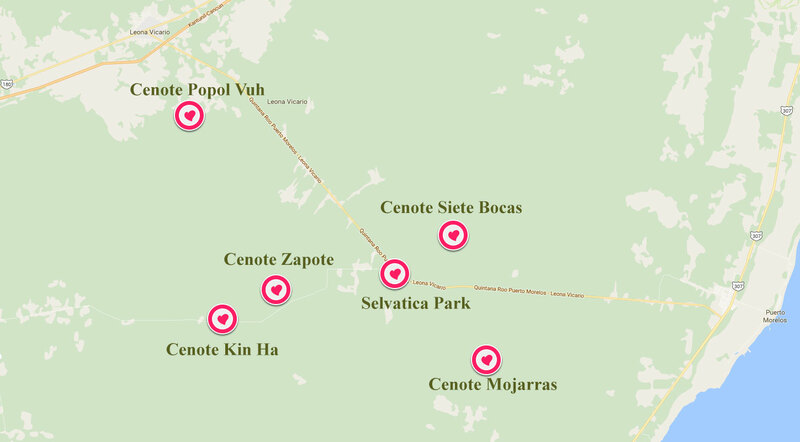 Cave Cenotes: Are those having a horizontal entrance with dry sections. 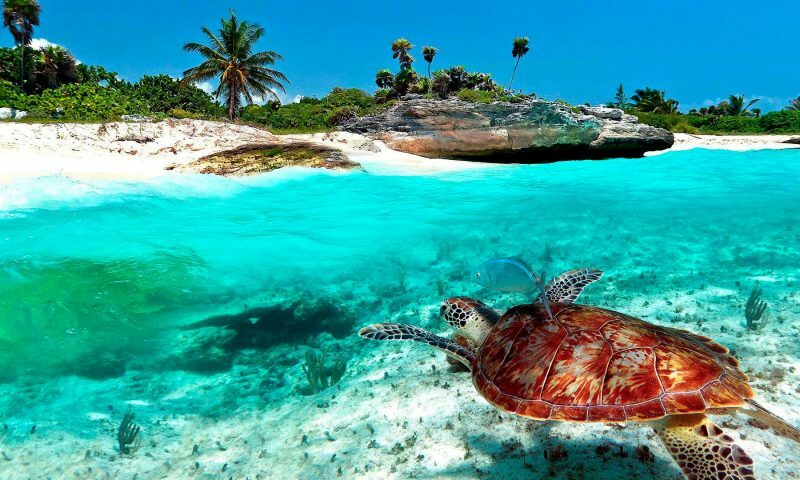 This beautiful places inspire adventures, explorers, snorkelers, scuba divers and people who want to experience the beauty of nature swimming through its crystal and fresh waters and admiring the ancient formations of stalactites and stalagmites in the Cenotes. 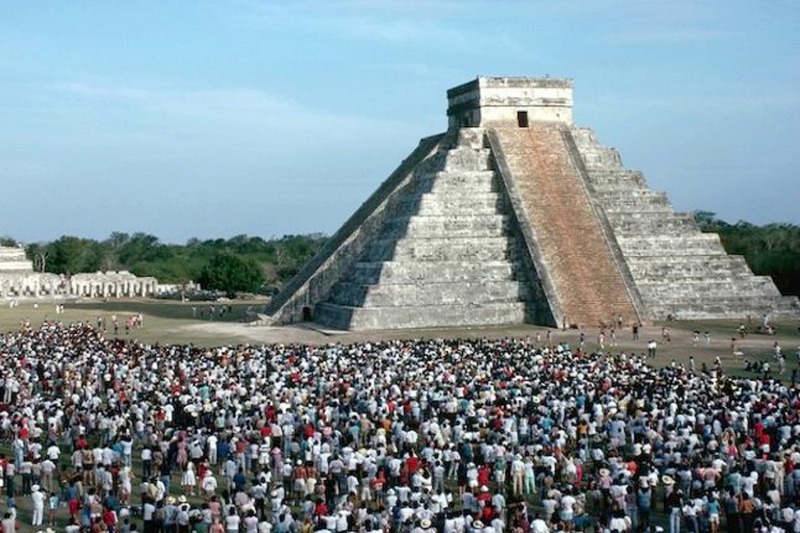 It is located into the jungle near Tulum. 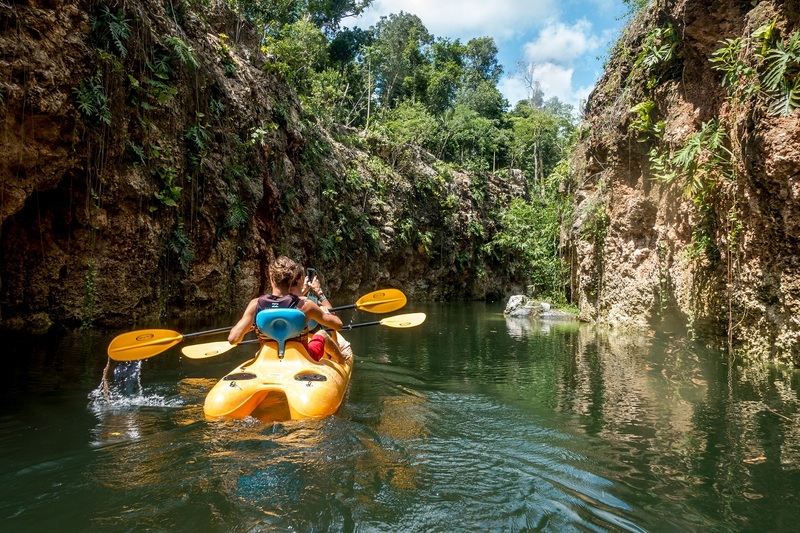 This Cenote is also known as a pet cemetery due to the enormous amounts of fossilized animal skeletons found in the caves. 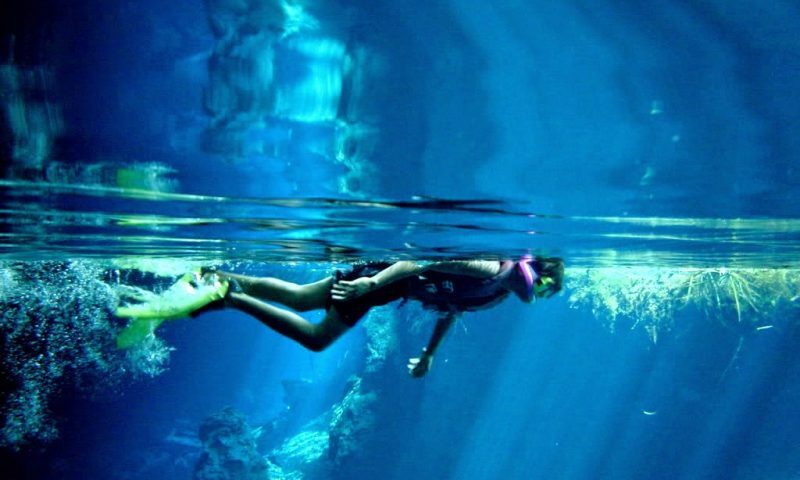 You can practice snorkeling through its crystalline waters and admire the thousands of formations of stalactites and stalagmites. 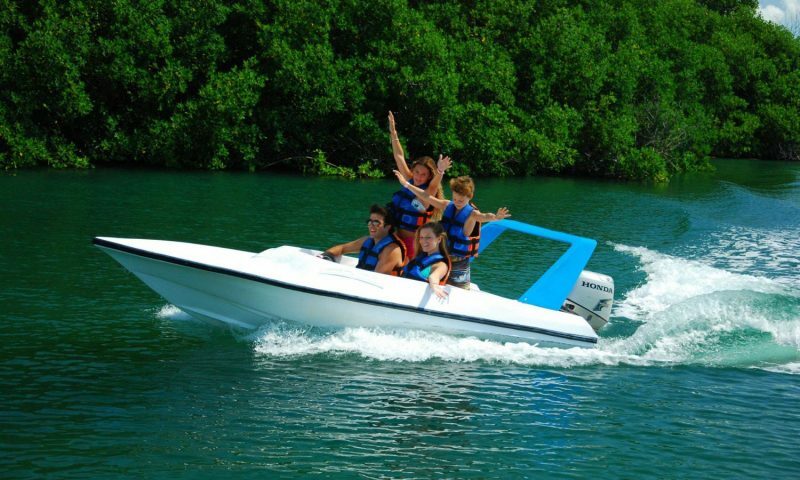 It is located near to Xel ha park and is one of the most filmed and photographed Cenote of the Riviera Maya. 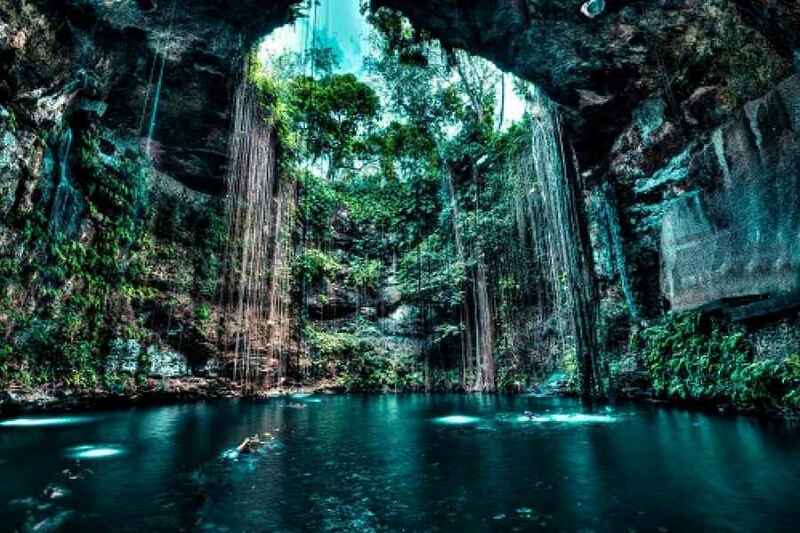 This Cenote is made of two sinkholes of approximately 70m in diameter, connected by a 400 meters long passageway. 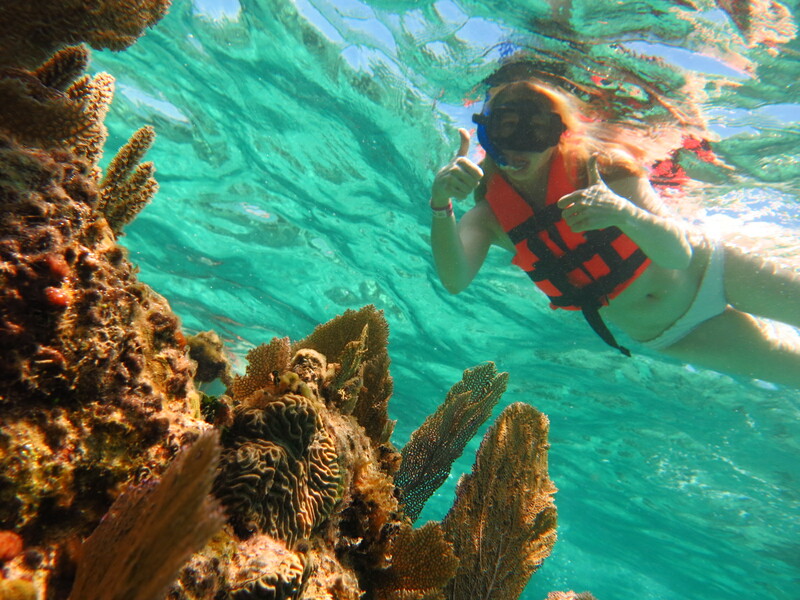 Its water temperature is perfect for snorkeling throughout the year. 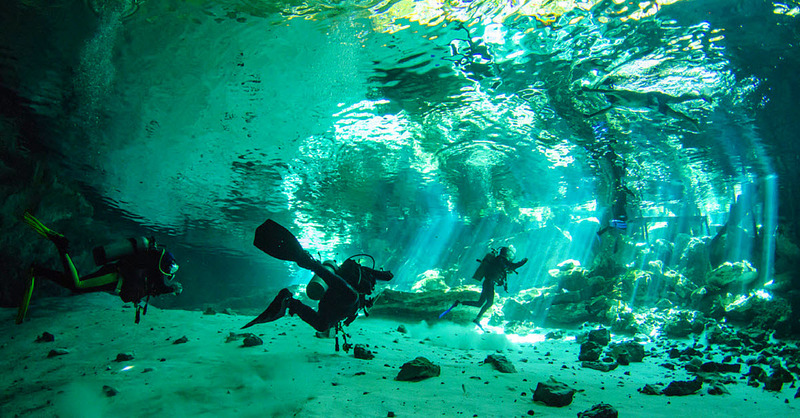 The Cenotes in the Riviera Maya are deep, water pits in limestone that are created when the roof of an underground cavern collapses. 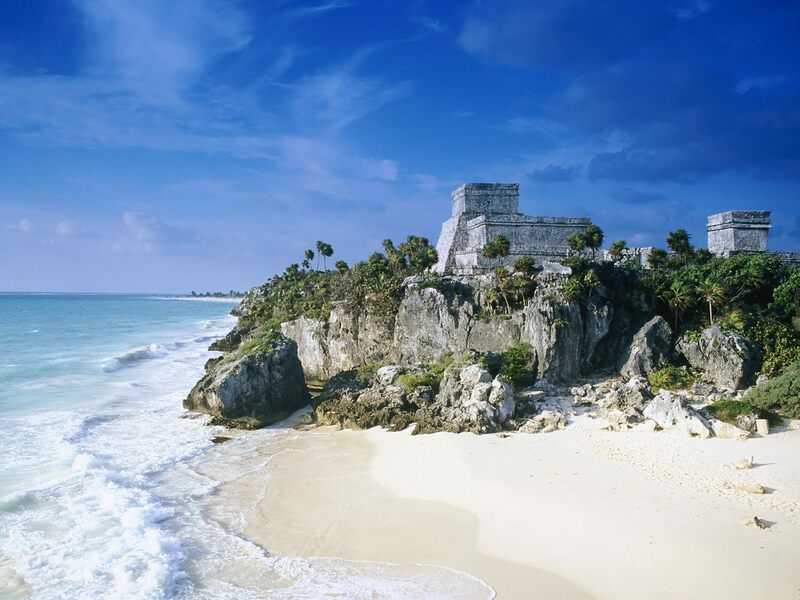 This creates a natural pool which is filled by rain and water flowing from underground rivers. 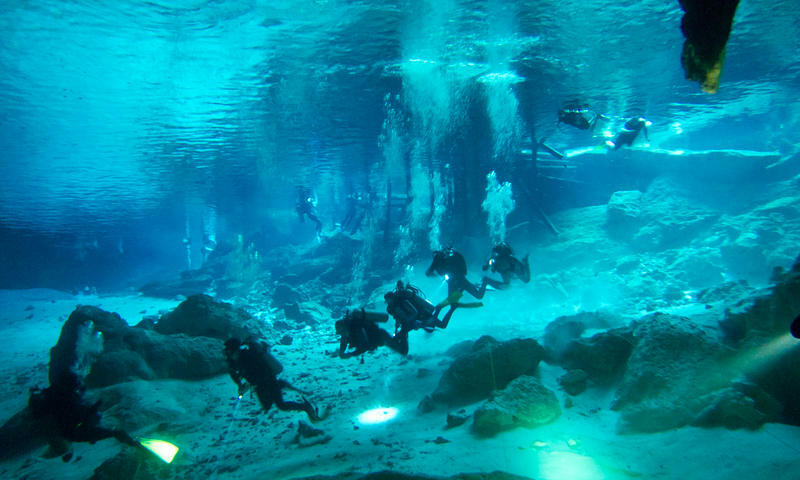 Some Cenotes in the Riviera Maya are vertical water-filled shafts, while others are caves that contain pools and underwater corridor in their interior. 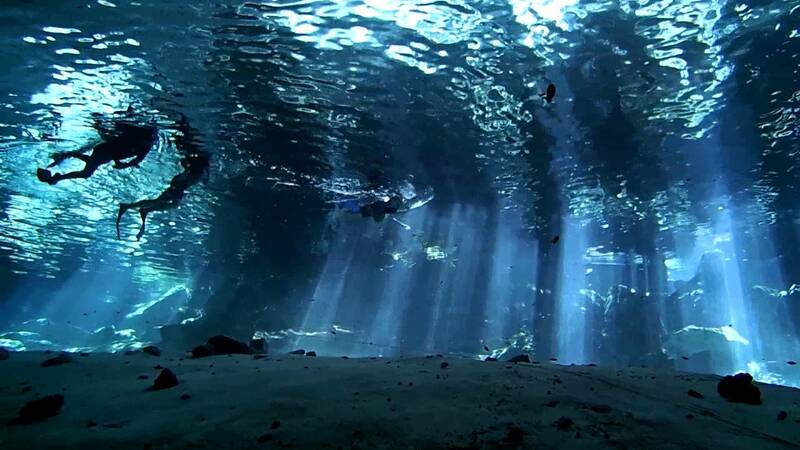 The water filling the Cenotes is rain water that has filtered through the ground, it has few suspended particles, so the water is extremely clear. It is a delight to dive in. 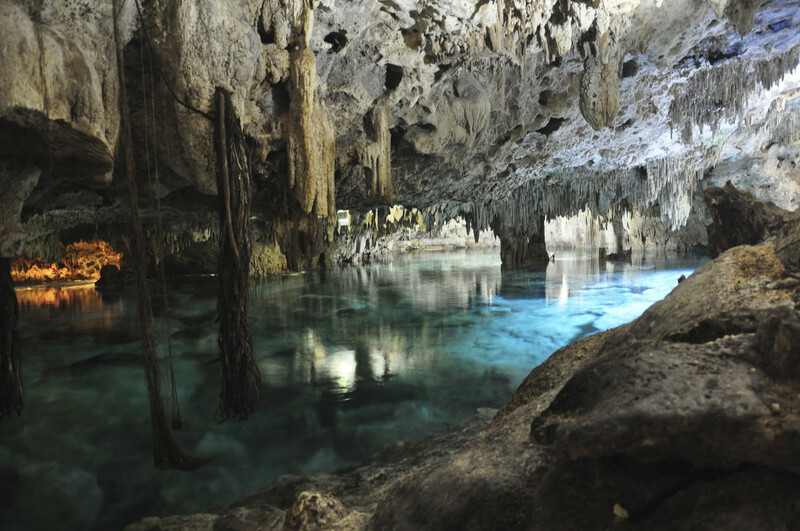 Cenotes had a ritually significant to the Mayans, because they were considered passages to the underworld. They had sacrificial purposes too. 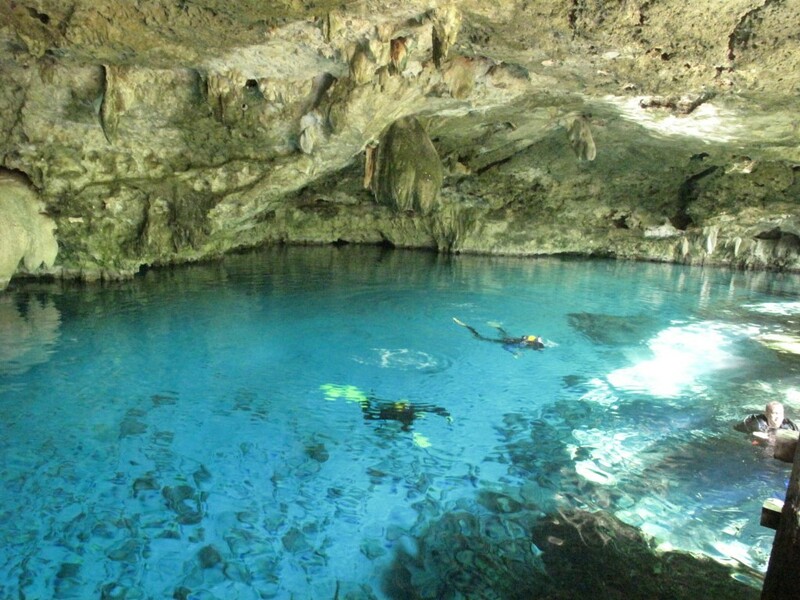 The Cenotes nowadays are a big attractive for tourists who enjoy them for swimming, snorkeling or diving. 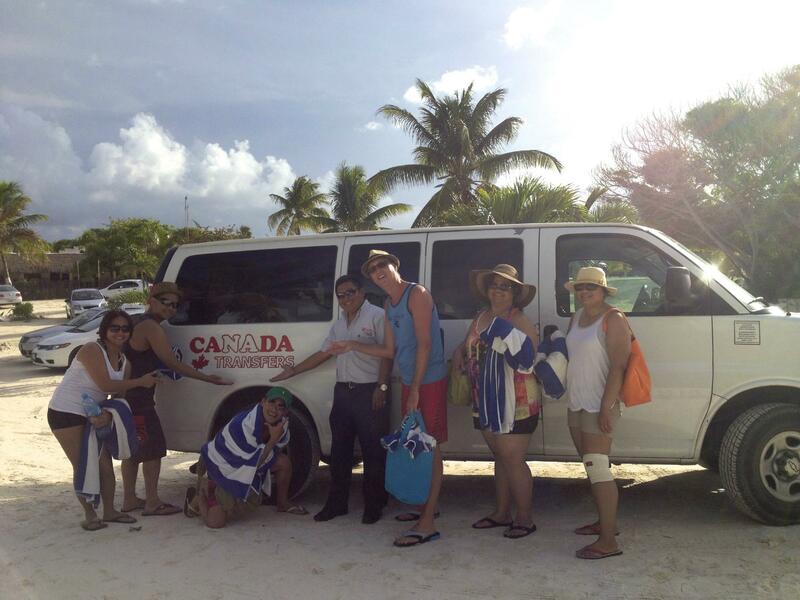 Canada Transfers offers private excursions to different Cenotes. 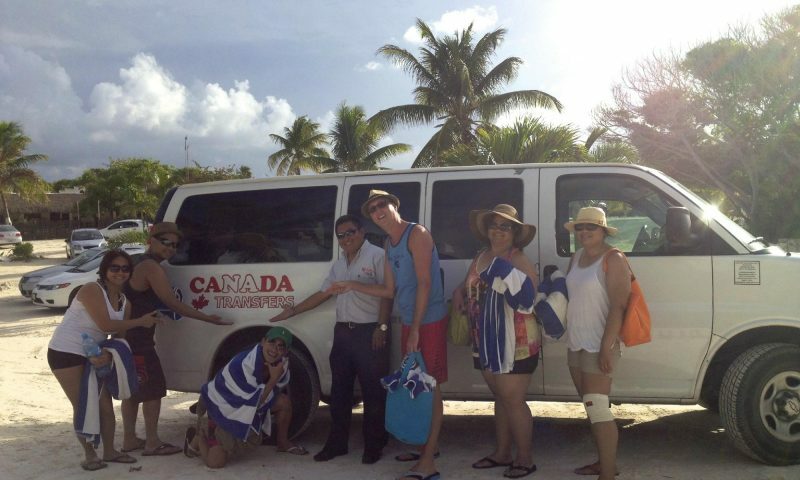 https://www.canadatransfers.com/private-tours/ Here are some of the most important. 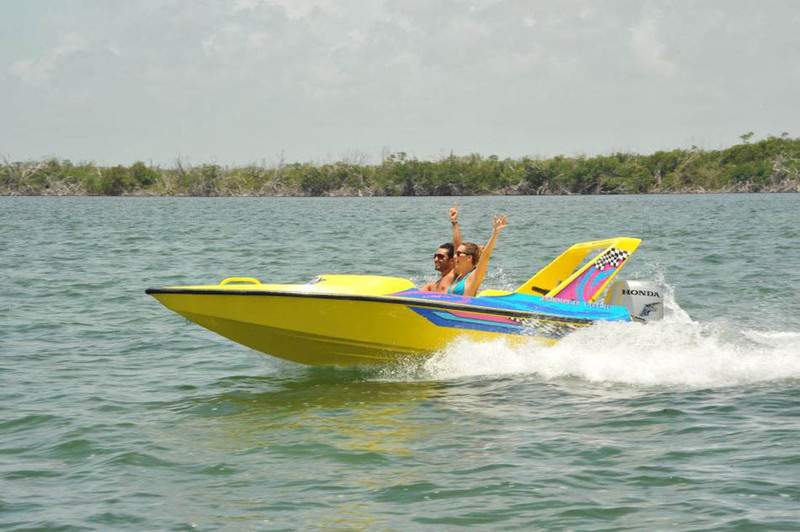 You have an exclusive vehicle for you and your companions. You have a professional and bilingual driver. You decide when to return to the hotel. 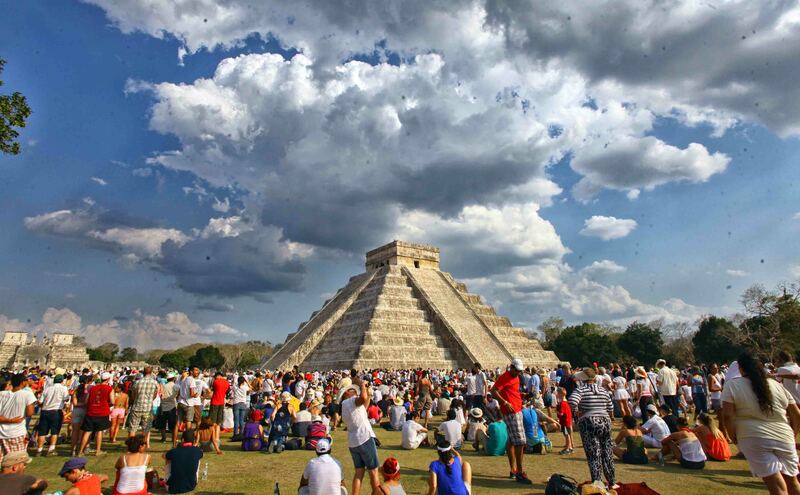 Chichen itza and Cenote Private Excursion: It is one of the main archaeological sites in Mexico and one of the most representative and renowned vestiges of the Mayan culture. 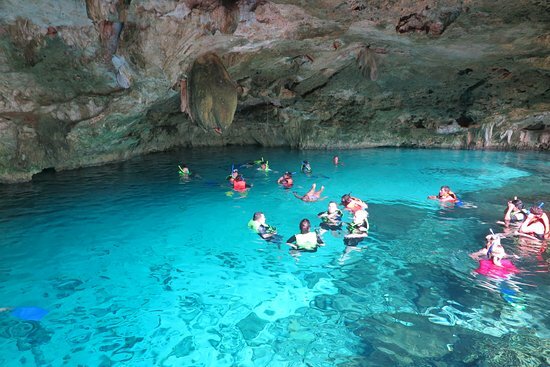 Enjoy the Cenote for swimming and cooling. 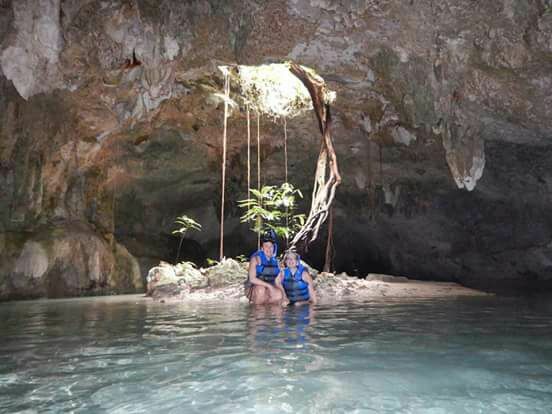 Cenote swimming Private Excursion: The Riviera Maya is plagued by natural holes called Cenotes. 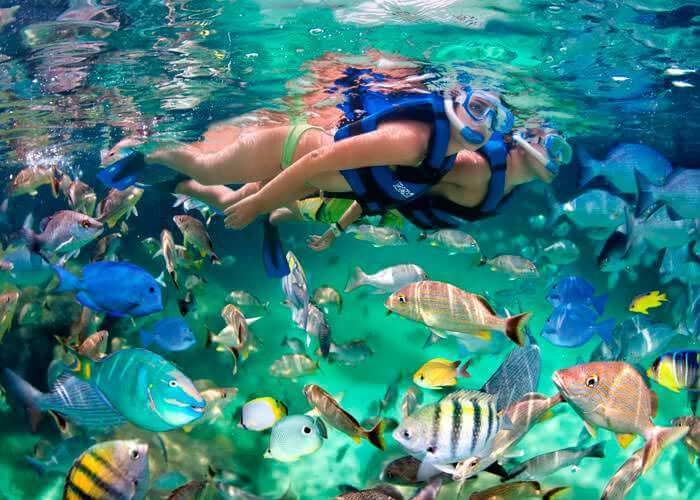 The interest and the pleasure to submerge in its waters has increased among the tourist who visit Cancun and Riviera Maya. 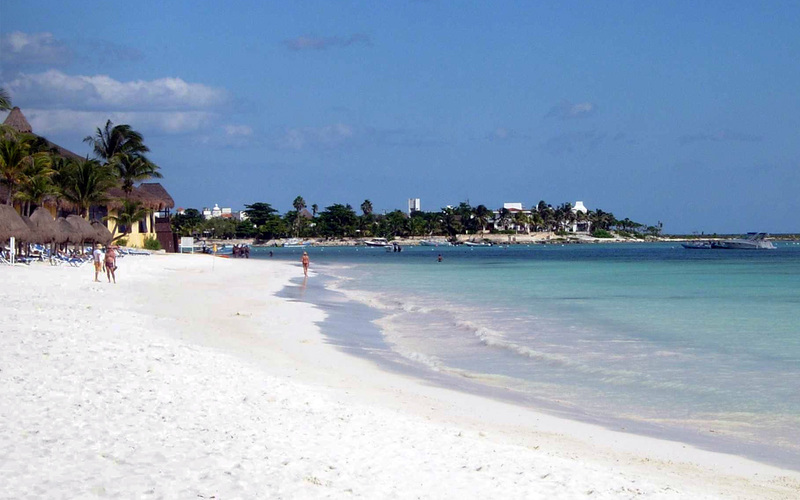 Tulum and Cenote Private Excursion: Tulum is one of the most cultural attractions of the Riviera Maya due to its walled city and spectacular view of the Caribbean Sea. 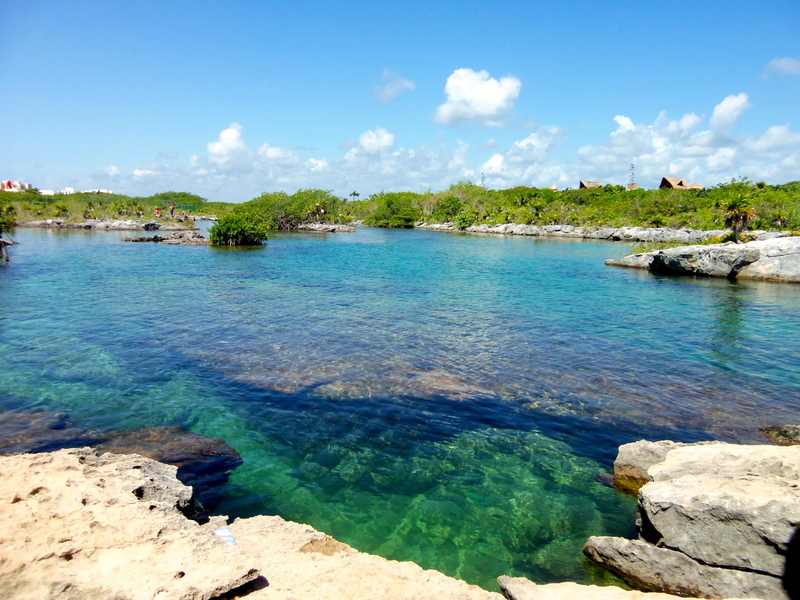 Also visit and enjoy a Cenote to refresh you after the heated walk in the ruins of Tulum. 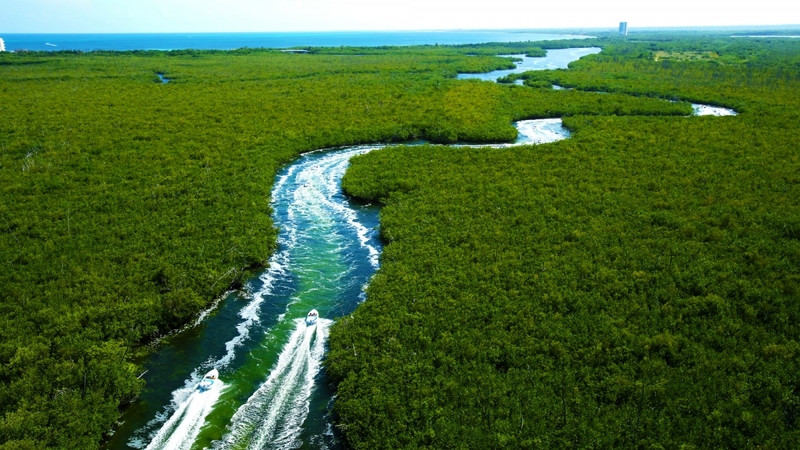 Xcaret Private Excursion: You will visit the most famous Eco Theme Park, where you will find underground rivers, grottos, aviary, snorkel, beach, an spectacular Mexican night show and a lot more activities available. 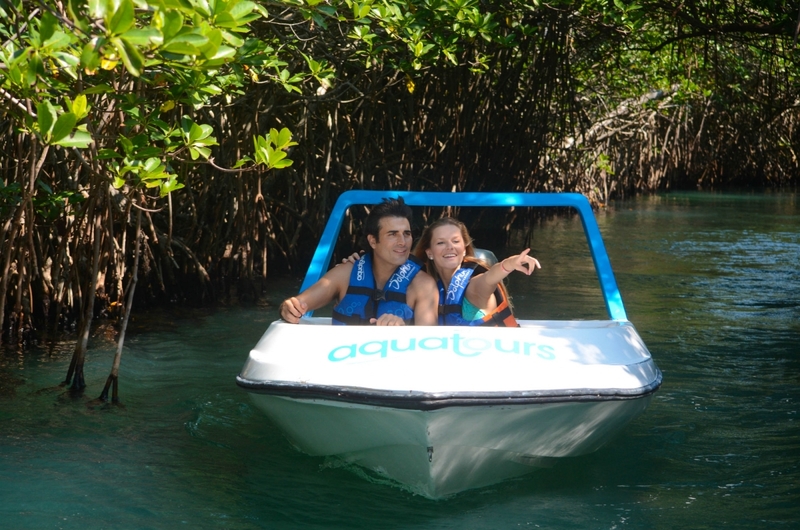 Xel ha Private Excursions: Enjoy an unique experience with its amazing coves, cenotes and ponds in the middle of a breathtaking landscape, one of the most beautiful in Cancun and Riviera Maya. 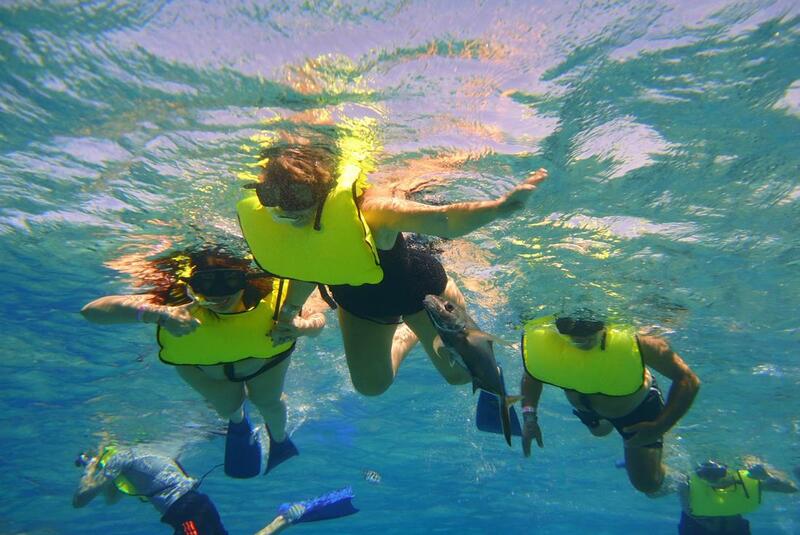 Enjoy this snorkeling paradise, with variety of fun-filled activities. 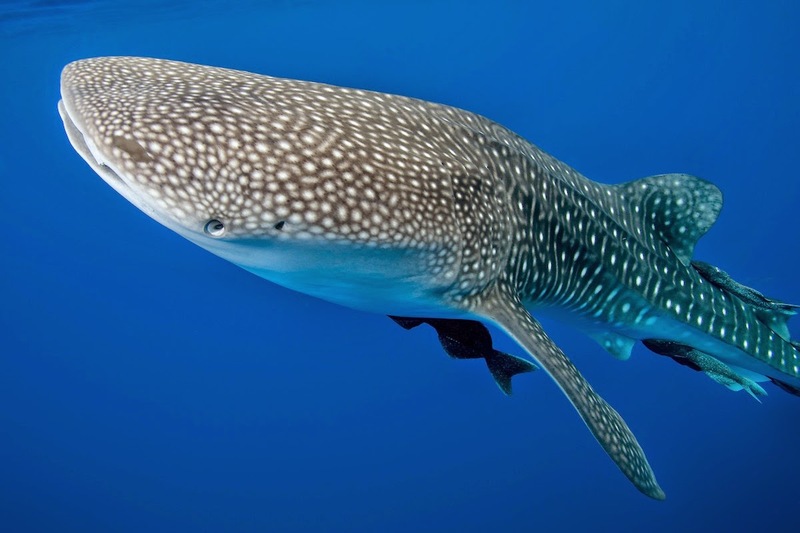 The Whale Shark belongs to a subclass of cartilaginous fish. 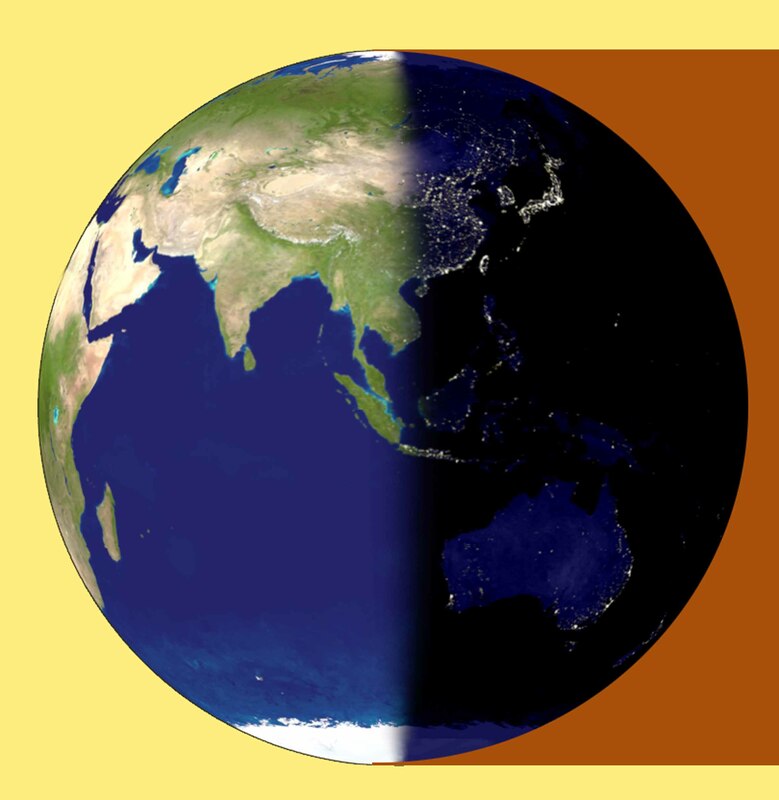 Scientific studies affirm that it inhabits the earth for 60 million years. Is so far considered the largest fish in the world. The Whale Shark has a particular characteristic that sets it apart from other sharks: Its beautiful skin with polka dots and light colored lines. Its skin measure up to 10 cm thick. 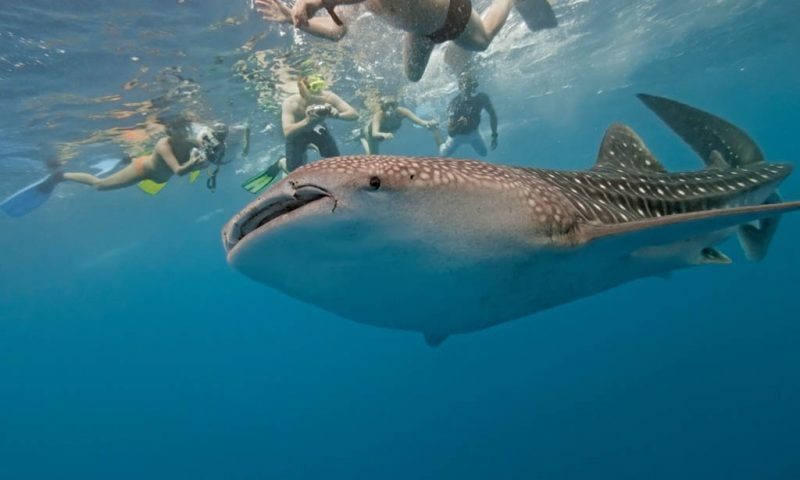 The whale shark usually have a length of 31 foot and a weight of 9 tonnes, although sharks of more than 40 foot and 21.5 tonnes have been observed. Its wide mouth can open about 1.5 meters. Inside its mouth there are 300-350 rows of teeth and 10 pairs of useful pads to filter its food. 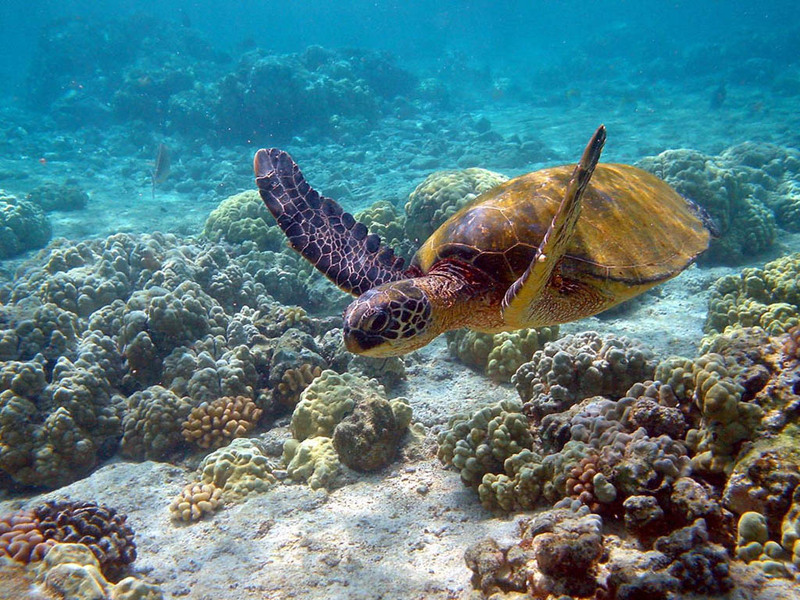 These animals are not excellent swimmers because when swimming with the whole body, they hardly reach the speed of 3 mi/h. This shark has been observed alone or in groups formed by 100 or more specimens. The whale shaks can live with other groups of fish and stingrays. 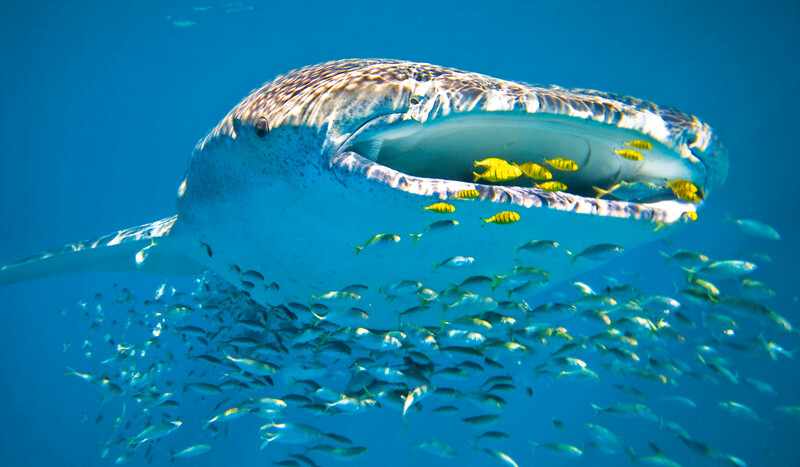 Only three species are fed by filtration, and the whale shark is one of them. When it opens its jaw to feed, a lot of water is also absorbed, so it is expelled through a filter located in the gills, storing the important food. If something gets caught in its gills, this fish uses a kind of “cough” to remove the obstruction. 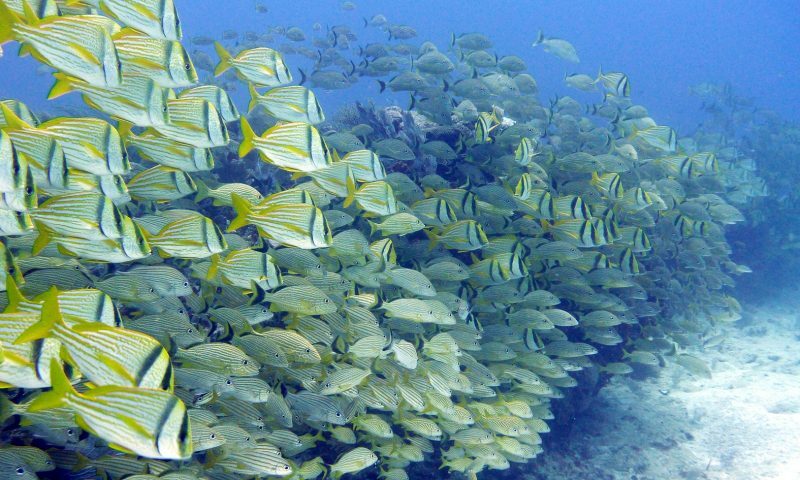 They feed on plankton, jellyfish, anchovies, fish larvae, corals, phytoplankton, algae, krill, crab larvae, squid, sardines, mackerel and tuna. 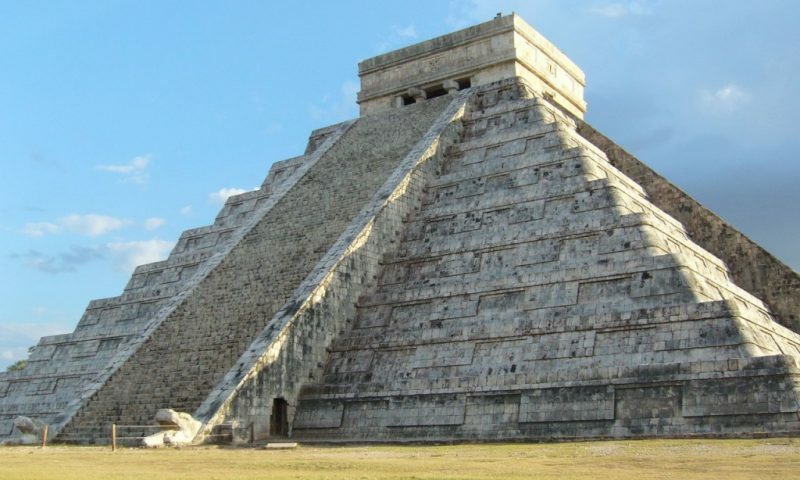 The reason for the presence of teeth is unknown, since they are not used for eating. It is known that sexual maturity in males is reached at 30 years of age, when they measure is about 9 meters in length, however in the females has not been determined yet. They are ovoviviparous. The pups are formed in eggs inside the mother and they give birth to developed offspring. At birth, they are between 40 and 60 cm long. 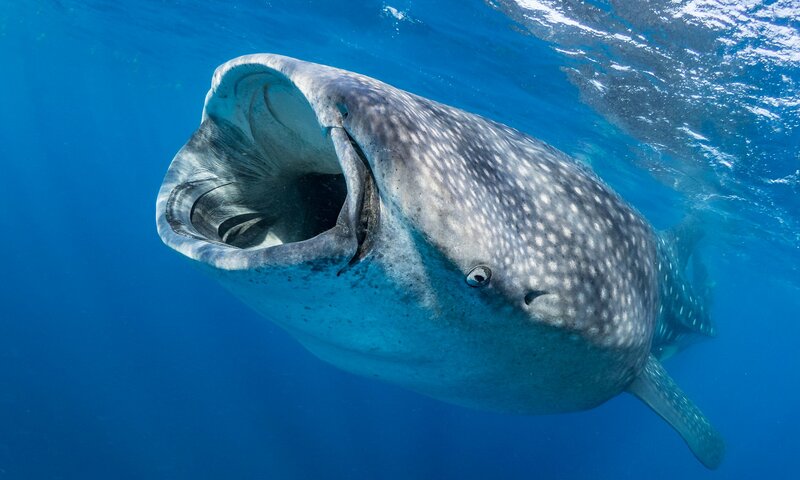 The Whale Shark has a longevity of 100 years of age. 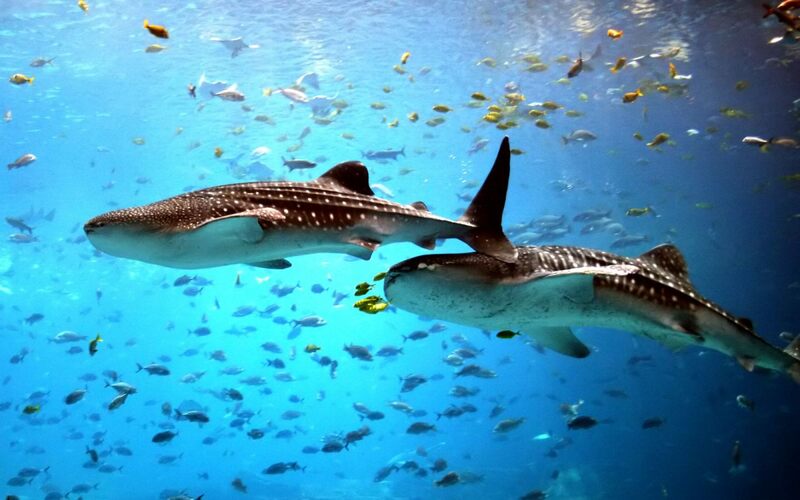 The official whale shark season is from May 15 to September 15 of each year. 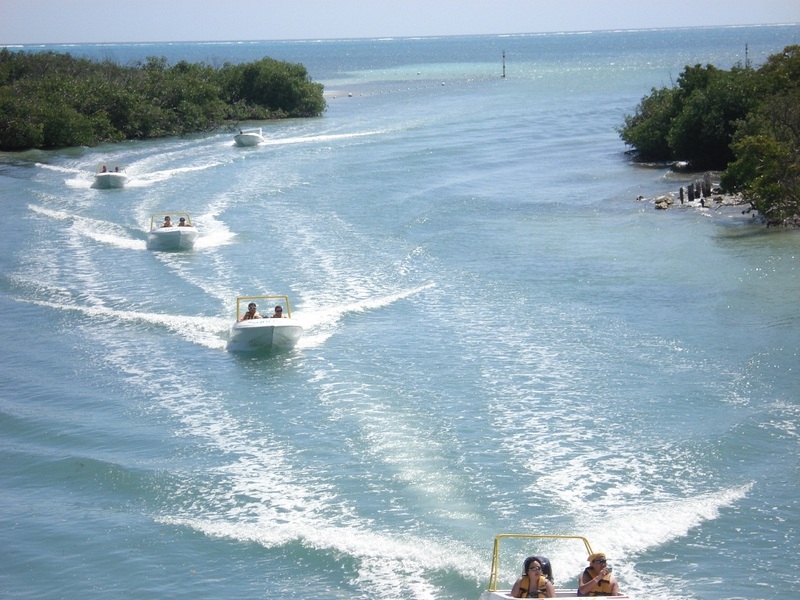 This is an activity that is controlled and regulated by federal environmental authorities. 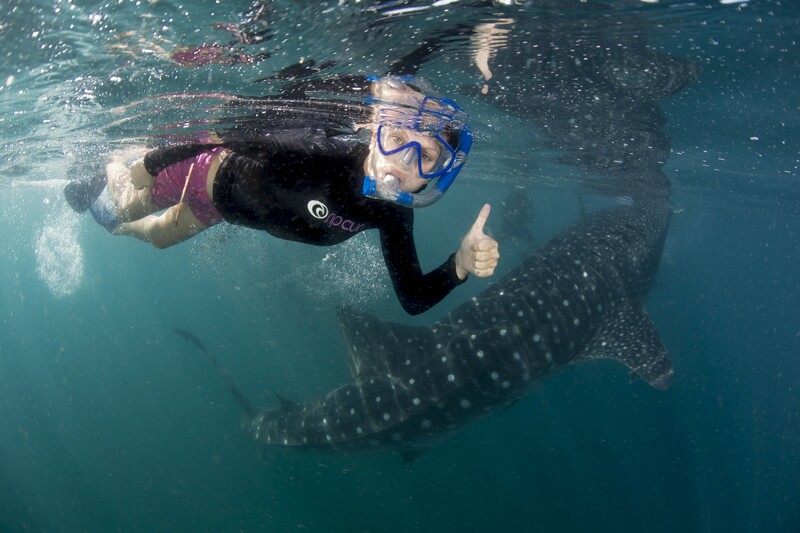 The Whale shark is very docile and gentle, and does not panic when approaching divers or swimmers. 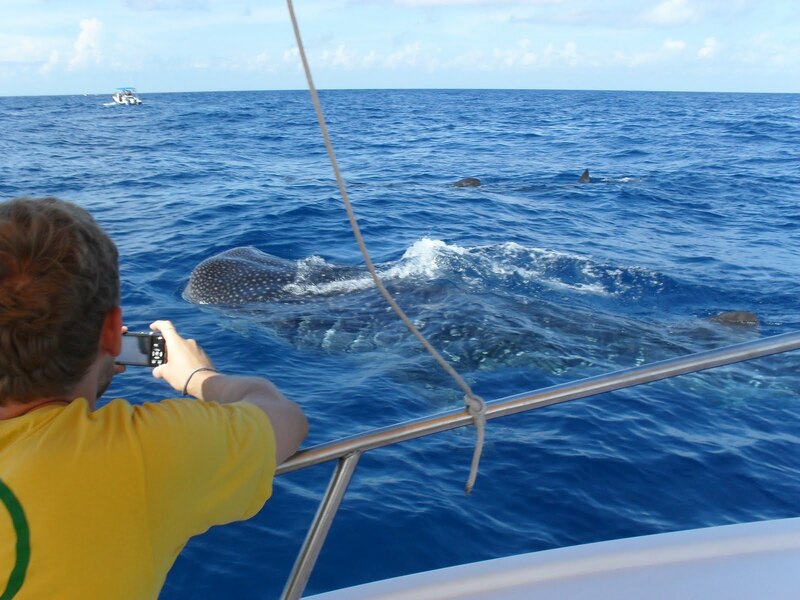 There are some agencies which organized these excursions for the observation of the whale shark. 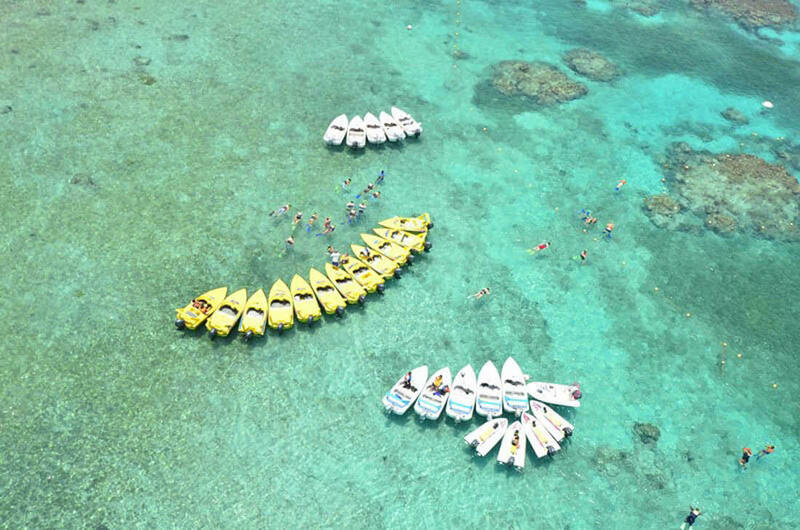 We invite you no to lose this experience during the whale shark season.